This aviators paradise we enjoy in San Diego is something many aviators appreciate but do not appreciate its fleeting existence. At Sky Tours, we realize the freedom may only last another decade because of drones, flying cars and taxi's causing new rules and congestion. Additionally, airports are feeling the crunch of lower fuel tax revenue and encroachment of developers. Only time will tell, but the cost of owning a small aircraft is going up faster than inflation. Why is it a paradise? First off, we have almost 350 days of perfect flying weather a year and some of the prettiest coast and city lines imaginable. 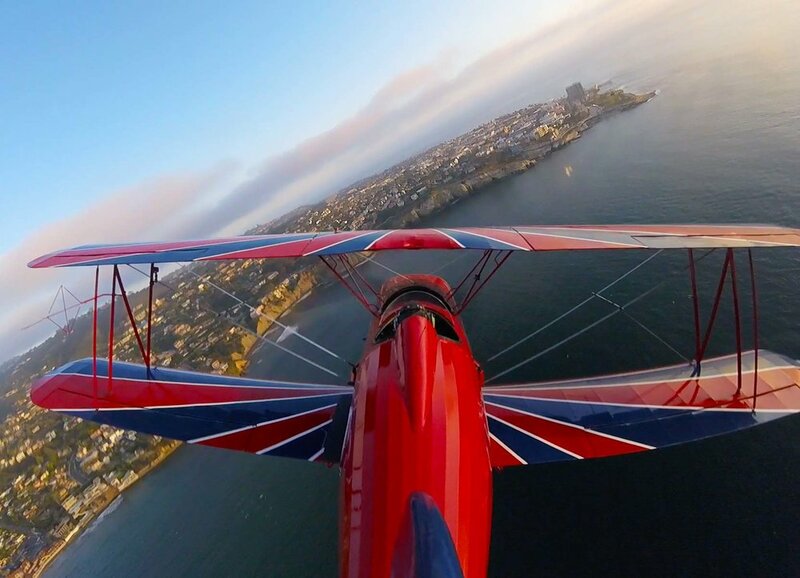 With our open cockpit biplanes, Sky Tours pilots wisp tourists and thrill seekers down the coast, over the bay and downtown searching for the treasures of the sea and the senses. Whale migration patterns bring Blue and Gray Whales down the coast many months of the year which make for an exciting flight. Besides the Whales, large pods of dolphins, sharks and sea lions are always found swimming in La Jolla Cove. There has been many a day when a biplane is seen zipping smoothly over kayakers and dolphins along La Jolla Coves beautiful cliffs and caves. One of my favorite tours to fly is our Biplane Sunset Bay Tour. We strap in the aircraft about 40 minutes prior to sunset and set up for a takeoff into the cool wind and warm evening sunlight. Besides gorgeous and super calm, this evening time is especially significant to professional aviators because we have a metaphor of 'Gone West' which calls for an honored moment of reflection for all the aviators who have passed on. ONE of the amazing sensations of the biplane is the clarity of smell, vision and aerodynamic forces. These moments are quite overwhelming and exhilarating. I don't mean to scare any one that may experience anxiety during flight, but unlike the airliner, you see what is going on, have confidence in your pilot and feel the stability and smoothness of the Great Lakes Biplane. I could talk about these evening biplane flights all day, but honestly it is just talk. You need to experience yourself. Spoil yourself or significant other at least once your life, but you will want to go every sunset thereafter! Please check out our pictures and videos, all the pictures and video's will give you a little glimpse of the pleasure of flight.